We at Fresh Ideas love to help our customers with their next purchase of soft furnishings, whether you’re looking to redecorate one room or furnish a whole house. 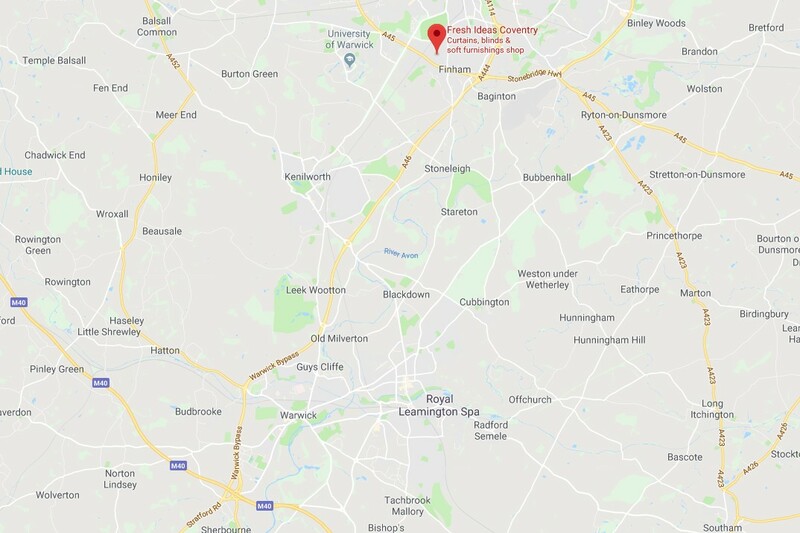 If you live in Warwick, we’re just a stone’s throw away and ready to help you. We’ve been providing quality made to measure curtains & accessories, blinds, carpets & wallpapers to name some of our products, since 1988. Our expert team in our showroom pride themselves on ensuring you enjoy your new home furnishings for many years, where we help you from choosing & coordinating to measuring & fitting. We offer a carpet uplift & disposal service along with a furniture moving service should you wish to take the strain out of having new carpets fitted. From the many thousands of designer curtain fabrics, we can make made to measure curtains & roman blinds which are all manufactured in-house by our experienced seamstresses to ensure you have the lasting finish every time. Coordinate this with our curtain poles & patio awnings we’re your complete service. You can borrow samples from our showroom using our sample loan service to ensure that the products you’re looking at will coordinate in your home. A warm welcome awaits you, with free parking outside our showroom we believe we’ll be your last stop when choosing your new home décor. Click below to see us on Google maps for directions, for your convenience we’ve listed the directions further down. New Scion Collections Now Available in our Showroom! Our showroom staff update facebook with new collections and inspiring designs from our range of products. If you see something we post on facebook that you like, come and speak to them about it!